Thomas was born on 26 September 1832 at Little Tew, nr Banbury, Oxfordshire to parents Kendrick Kench and Kezia Mullington. Kendrick was a carter and Primitive Methodist local preacher. In 1851 Thomas is working for the Westell brothers, solicitors in Witney. 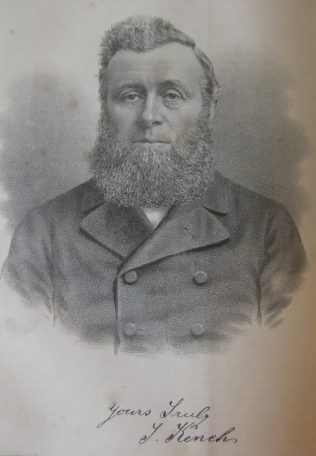 Thomas became a local preacher in 1855. On the Motcombe circuit, the Hindon Society had almost become extinct when Thomas went to reside there in 1862. A gracious revival broke out and a strong and vigorous society was soon at work. His obituary records that Thomas was hopeful and joyous in nature, he was deeply pious and had unbounded confidence in God. His piety was of a quite character, but was healthy, vigorous and manly, growing with his growth and expanding with his improvement in knowledge and advancement in years. His discourses were instructive, evangelical, practical and edifying, acting most effectively on the understanding and conscience of the hearers. Thomas was District Building Committee Secretary for five years. His business ability was of a high order. In the superintendency of his circuits he was sound in judgement, wise in counsel, conciliatory in spirit and pure of intention. Thomas married Mercy Herman (1842-1912) on 17 December 1863 at Wantage, Berkshire. Census returns identify four children. Thomas died on 5 October 1897 at Wooton Bassett, Wiltshire.